Rich tomato sauce mixed with herbs, roasted red peppers, and Italian sausage is heaped atop a bed of gluten-free pasta. Across the table, my companion savors a wood-fired pizza loaded with all the gluten I can’t enjoy. 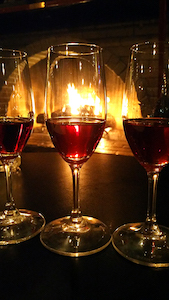 A lovely wine flight sits in front of us, and a crackling fire lights the brick hearth off to the left. Glancing around these warm and inviting surroundings, it’s hard to believe… am I really in a strip mall? However, the five-star Yelp rating is no fluke. And even though it’s nestled in the Seattle suburbs, this Kirkland staple is worth the short drive. 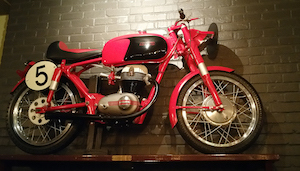 The vibe is casual, with interior decor dominated by kitschy Italian racing memorabilia and vintage motorcycles. Menu pages are filled with descriptions of mouth-watering Italian pasta and pizzas, including my favorite dish, the Criollo. And then there’s the wine. A board of by-the-glass offerings greets you at the front entrance. Glancing around, you’ll see bottles stacked on shelves, overflowing from niches, and generally occupying any available surface. Every bottle on the list is nearly retail price (no restaurant mark-up here! ), and there’s a well-curated selection of local, domestic, and imports to choose from. Their selection even includes an extensive list of ports, many paired nicely with decadent dessert offerings. But the best part? Prices are a real steal considering portion sizes are easily shared, a refreshing change from many of the trendy haute cuisine restaurants dominating the Seattle area. If you’re feeling overwhelmed by the choices, don’t worry. Waitstaff are encouraged to familiarize themselves with both the wine and food, so recommendations are spot-on. The service itself is friendly, speedy, and attentive. And you’ll hear many customers greeted by name, a sure sign of repeat business from the local crowd. It’s a perfect spot for serious wine drinkers who don’t need the pretension of emptying their wallets for a fine restaurant bottle. But it’s also great for families, first dates, vintage motorcycle enthusiasts, and anyone who believes you shouldn’t have to dress up for a nice meal and an excellent glass of vino. Cafe Veloce is located just 10 minutes from the famed Woodinville wine district, so you can come here to keep the party rolling after a day of tasting. After all, ordering a nice bottle from the foreign section is a perfect contrast to many of the local vineyards. 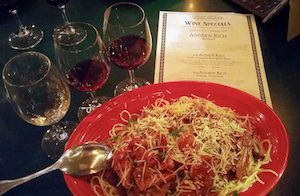 The next time you’re vacationing in Seattle, dine like a local and give it a try. Located inside the Totem Lake Business complex just off I-405, access to and from the cafe is quite easy. Park anywhere in the lot, then head for the glass doors located under the bright yellow and red sign. Monday – Thursday 11:00 a.m. – 9:30 p.m., Friday 11:00 a.m. – 10:00 p.m., Saturday 3:00 p.m. – 10:00 p.m., Sunday 3:00 p.m. – 9:00 p.m.
Sign up for their e-newsletter and learn more about Wine Flight Mondays. $7 gets you three two-ounce pours from a list of rotating vineyards from all over the world.